Wheatgrass can be grown at your home or bought from stores. Wheat grass has numerous benefits from prevention of cancer to treating grey hair. Although the usage of wheatgrass for human consumption dates back to the Egyptian civilization, its widespread usage is of recent advent, somewhere within the last decade or so. With social media and health awareness on the rise, new and successful health keeping ideas are being exchanged across the world. Just like how the benefits of yoga has spread to other parts of the world from India, some consumables such as wheatgrass, quinoa and oats which originated from other parts of the world has gained fame in India. Some sellers and resellers of health based food stuff blow small benefits of the product they sell out of promotions for marketing purposes. Hence it is always best to know the facts about the consumable products that are likely to provide various health benefits in its entirety. This article is related to such pointers about wheatgrass. Fact ? 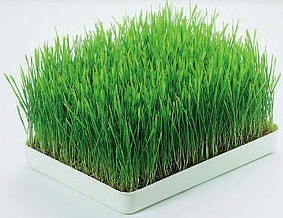 Wheatgrass is a plant that grows from cereals (wheat grain). Just like other plants wheatgrass also uses chlorophyll for its growth. As chlorophyll is linked to oxygen in the growth process, it is rich in anti oxidants. Anti oxidants are known to have anti carcinogenic properties and hence may aid in the prevention of cancer. Also research and tests performed on animals show that consumption of wheatgrass has the ability to alter DNA and provide some protection against damages caused by radiation. However, the fact remains that evidences on the success rate of the above mentioned details are lacking. Fact ? Dietary fiber is available in plenty in wheatgrass. Fiber included in your daily food can make you feel full for longer periods as compared to other food stuff. The plus is it also known to provide smooth and regular bowel movements, aiding in digestion. However, wheatgrass consumption alone cannot work like a weight loss pill. Fact ? Its is a known fact that bones in the human body can get damaged in an acidic environment inside the body created by meat, dairy, tamarind (tartaric acid) etc. The more you include fresh fruits and veggies in your diet the more healthily would your bones remain. This hold good for wheatgrass as well, which is part of the plant family. Hence if someone says wheatgrass can help strengthen your bone, don?t hesitate to believe them for its true but tell them that other veggies and fruits do the same. Fact ? As stated already, wheatgrass is rich in antioxidants which have several beneficial properties. Although the essence/juice of wheatgrass on your skin can overcome dryness and slows down aging, there isn?t any evidence to prove that it provides a glowing complexion. Wheatgrass is loaded with benefits when consumed in moderation. It is one of the easily available antioxidant which is also rich in proteins, vitamins and minerals. Include them in your daily diet much like fresh fruits and veggies.